Flat water and fog was the story today, perfect conditions and easy fishing. Hardly a ripple on the water, so calm you could spot large schools of humps and coho milling on the surface…a fly fisherman’s dream today. Yes a nice day to be out fishing at Langara. Results were sporadic, I fished one hour this changeover morning and had a couple springs and two coho at 8 lbs, seemed decent. Looking in the fish totes on the dock there was about a chinook each and a couple coho for an average for those that went out on the short fish. This afternoon, fishing with Mark Heine and Paul Glud we had two chinook and a handful of coho, and a bucketful of Humps to show for our angling time. The bite was short and early afternoon, those that slipped out later were scratching hard. 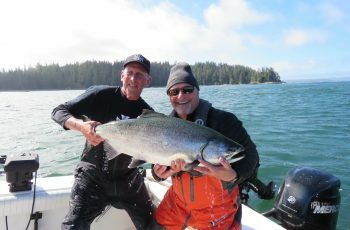 Our trip that concluded today, saw another 50 lb fish, a chinook retained buy a self guided boat Carlo Wein. I never had a chance to talk to him and have no information about this fish at all, the guides never heard a thing. I did see the fish in a bag on change night, down at the fish pit, so confirmed, Carlo had a monster. 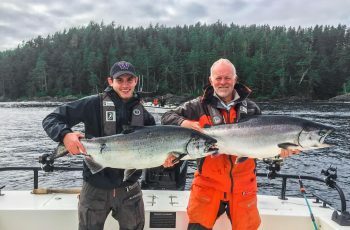 Jason Marquardt released a 43, down at the Jalun, did hear about that one, well done Jason, and thanks for the release, top fish in the Father Sons Derby put together with host Paul Douglas and the PCL gang. 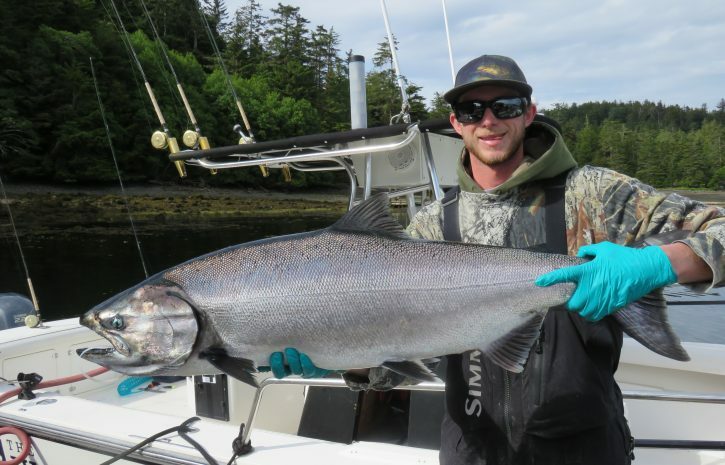 Fishing for chinook was again slower for the trip, but overall a lot of fish were taken and a bunch released. 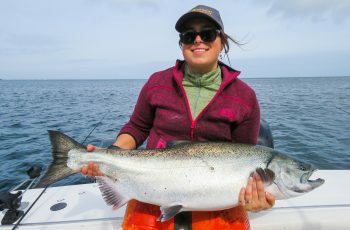 Massive schools of pinks are migrating through the area, and coho populations are building every day. You are getting plenty of bites, sometimes every few minutes. 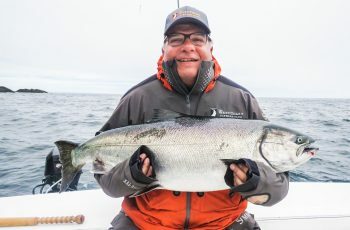 Some guides are towing gear around, I tossed a 500 tomic out, old reliable hammered plenty of coho and some decent chinook. 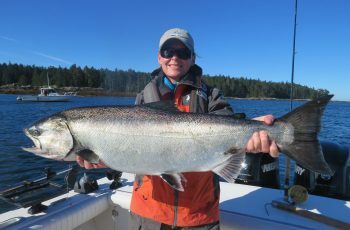 Dj from NIL had a couple very nice kings on the tomic as well, fishing on the floor, 140 feet off the rigger. Without that rigger, how would an angler fish spoons and plugs at these depths? Thanks again to Scotty! Sure is nice to put the bait away for a bit when the pinks are pouring by. Talking to the guides most are having to search pretty hard for chinook, fishing the Jalun, the REEF and Cohoe point at a variety of depths. There is bait everywhere, needlefish stacked at the Jalun, plugged at the REEF, and heavy in at Cohoe, with whales stacked like cordwood from the nursery into little Cohoe. Nice report. Sorry the chinooks are so elusive which is sometimes the case. I’ll be fishing later this month much south of you near Bella Bella. Sixteenth year to return there. I’m expecting lots of Cohos and some Chinooks – we’ll see. Keep the good reports coming. A tubby tomic in the 602 pattern is one of my favorites. The last few years we’ve been using mostly hardware: flashers with hootchies, & various spoons. I also like a Pro Troll teaser head with an echip and a whole herring. You have me wondering if we’ll have the same Humpy/Pink problem that you are experiencing. I’ve seen it in the past. Most years they aren’t a big problem.